Wallpaper for homes and offices. Romanelli Wallcovering has installed more than 125,000 square feet of wallpaper. We can install residential prepasted paper and vinyl coated paper, untrimmed designer papers, grass cloth, wallpaper murals and commercial wallcovering. We have successfully installed Maya Romanoof, Knoll and Maharam textile wallcovering. Attention to detail is given to the seams or joints between the wallpaper pieces. Most 54" (the width per sheet) textured or smooth commercial vinyl can appear "seamless" if done correctly. Large mural at the official British tourism agency in the USA in New York City. 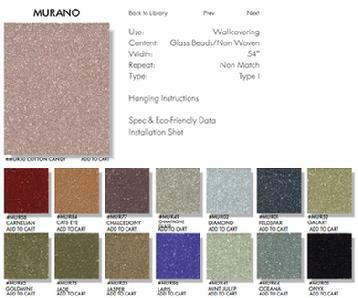 "Innovations USA" Murano, Italy glass beaded wallpaper in a private residence midtown Manhattan, NY. 32 rooms of commercial vinyl at Marriot Hotel at the Newark Airport, Newark, NJ. 12 rooms of commercial vinyl at the new Hampton Inn, Staten Island, NY. All the vinyl and borders in hallways and patient rooms at the Aloha Nursing Home Kailua, Hawaii. 55 rooms of 54” commercial vinyl at the Hyatt in Waikiki Beach, Honolulu and 15 rooms at the Hyatt, Kaanapali Beach Maui, Hawaii. 54" vinyl in the lobby at Tripler Army Hospital, Honolulu, Hawaii. Many commercial buildings and residences including the lobby of the Officers Club, dental clinic and main gate with 54" vinyl at Hickam Air Force Base, Honolulu, HI. 23 Van Luit murals in the alcoves of the hallways at the Los Gatos Meadows, a retirement community in Los Gatos, California. The Japanese wood block print/ murals had been printed in 1968, stored and installed in 1985. 36 elevator lobbies of 54" vinyl at Canterbury Place condominiums Waikiki Beach, Honolulu, Hawaii. Bradbury and Bradbury Reproduction Wallpapers. 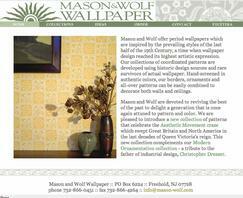 Great reproduction wallpaper from a local company - Mason and Wolf Wallpaper. Glass Wallpaper? 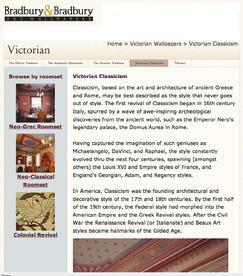 Click images for links or larger pictures.